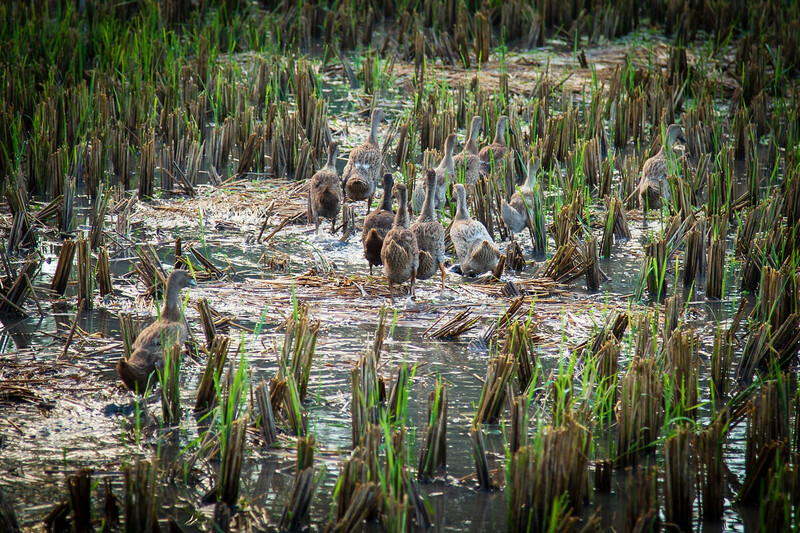 There is a hidden army in the rice fields of Bali. Although small in stature the soldiers in this army perform a big job —protecting the paddies from invasion. For little glory these little fighters battle, the field of insects, weeds and garner only the remnants of the previous harvest as wages. Despite being driven hard by flag-waving Generals these soldiers perform their task with only the occasional quack. 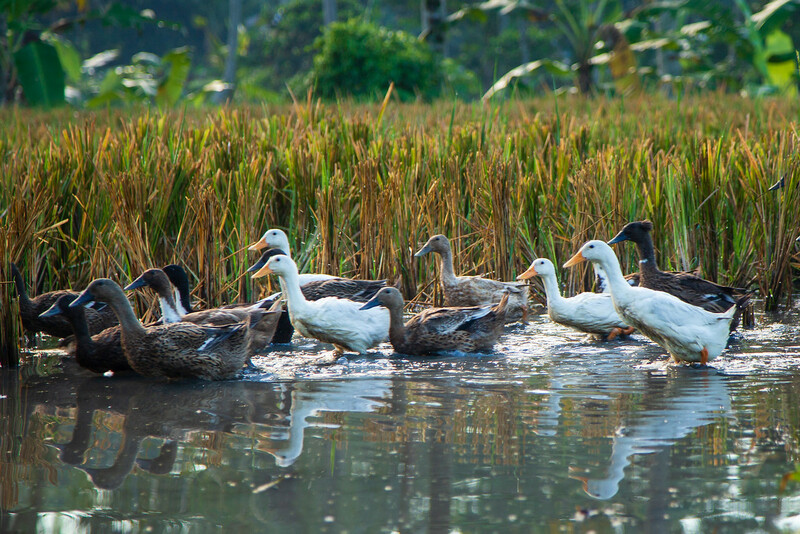 Ducks have long been used in Bali, Indonesia to protect and maintain the islands rice crops. After a field is harvested and drained, the duckmen ­— wranglers, duckaroos, shepherds, duckpokes, whatever — wave badlings (yes, that is what you call a grounded flock) of ducks into the fallow fields to clear them of remnants of rice grains, tiny eels, bugs and the tender shoots of newly emerging weeds; fertilizing as a bonus. The duckwhispers use flags to guide the raft (floating ducks) through one field into the next. They know when the warriors are tired and have had enough because they quit quacking and settle down for a rest. 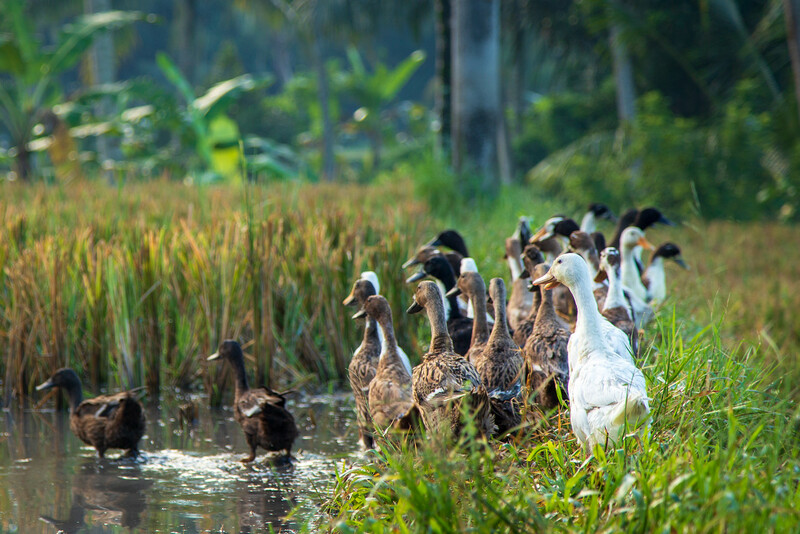 After harvesting, cleaning “a la duck” and prayers to Devi Shri, the rice goddess, the Balinese farmers through a system of community collaboration and Hindu ceremonies, use an intricate system of streams, irrigation canals and dams to refill the paddy for the next planting. The little house I am renting is right on the edge of a huge terraced field of rice. To me, it is a source of endless fascination watching the symphony of man and nature prepare for the next harvest. So adorable… Must be lovely to live near nature. Yes Mavis, it is a beautiful spot. Funny how quickly we forget when we are away for a while. I yearn with all my heart to do what you’re doing. How to begin? Still have a daughter in high school.